You are here: Home / Europe / Croatia / Hospitality, Service, and a New Clutch. But Wait! Now The Battery? Hospitality, Service, and a New Clutch. But Wait! Now The Battery? The kind and generous Mr. Krajl of Ostrea Hotel helps me get Doc back on the road. Sunbathers appeared on the docks below my room early this morning. The temperature is already pushing 80 degrees, and I haven’t had coffee. After a refreshing shower, I join the other guests eating breakfast on the patio outside. It’s not long before the waitress brings me coffee and with it a small plastic bag with a new clutch cable. “You’ve been waiting for this,” she asserts. Mr. Krajl will meet you here after 9 AM. The cable is coiled tightly, and my first thought is that it’s too small. I shrug that off because I don’t remember, and on Saturday I didn’t have much time to inspect it much more than my initial diagnosis. Plus, it’s been quite a few years since I last replaced the cable. It was roadside in Tanzania on a blistering hot day. The original clutch cable lasted about 50,000 miles. At almost 90,000 miles, it looks like the replacement didn’t last as long. A little after ten o’clock, Mr. Krajl shows up with about an 8-foot trailer hitched to his car. At the souvenir stand where my bike has been parked for the past two nights, he recruits assistance, and we push Doc up the ramp and secure it with a single tie-down. He suggests I sit on the bike while we cruise just two kilometers down the road. “Please go slow,” I ask. Within a minute of driving toward the mechanic’s shop, it seems Mr. Krajl forgot my request. I’m sitting on the bike with the side stand down, my hands grab the handlebars, and as we roll through a few dips, the bike shakes. I can’t put my feet flat on the base of the trailer, so I brace myself with my feet on the pegs. I swallow hard and hang on. A few minutes later we pull up to a small concrete building. It looks more like a house than a shop. There’s no sign, and the entrance is down a steep embankment. Inside we meet Antonio. His head is buried under the hood of a Peugeot. The shop is clean, and Antonio dressed in a black t-shirt with black shorts and wearing sandals, hardly has the appearance of a mechanic. But he is; an auto mechanic, not a bike mechanic. He doesn’t speak English, save a few words. But says he understands more than he can speak. I need not explain what we have to do because this is a straightforward fix. I’m just happy we can repair it inside a garage and out of the sun and with proper tools. We roll the bike off the trailer, and I coast down the embankment and into the garage. I have one more request. My exhaust is rattling. It’s also too loud. I need to repack the muffler, but this is more than we can do here. Though I’ve arranged with Dooby in Zagreb to fix that later next week, I want to secure the baffle inside to stop the rattling. To do this, he must tap new threads and solder a nut to the inside the end cap. He’ll be ready to work on the bike once he’s finished with the Peugeot. So I get to work pulling my bags off the bike, remove the old cable, and pull the end cap off the Supertrapp pipe. He tells me to come back in a couple hours, and we’ll finish the repair. 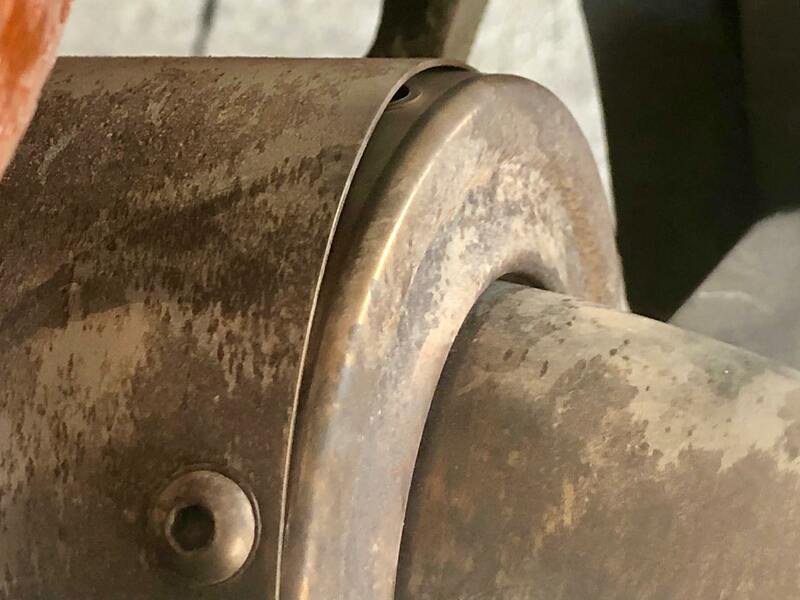 Inside of my Supertrapp exhaust pipe reveals the annoying rattling noise was from a bolt that sheared off due to heat and vibration. 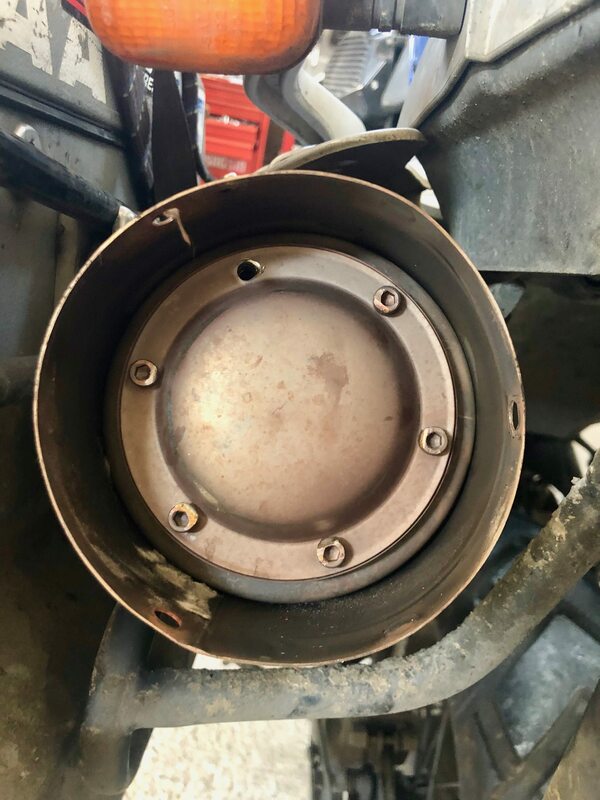 Also, the end cap for the exhaust had rattled loose and Antonio had to quicky devise a solution and solder a new bolt to the inside of the end cap. 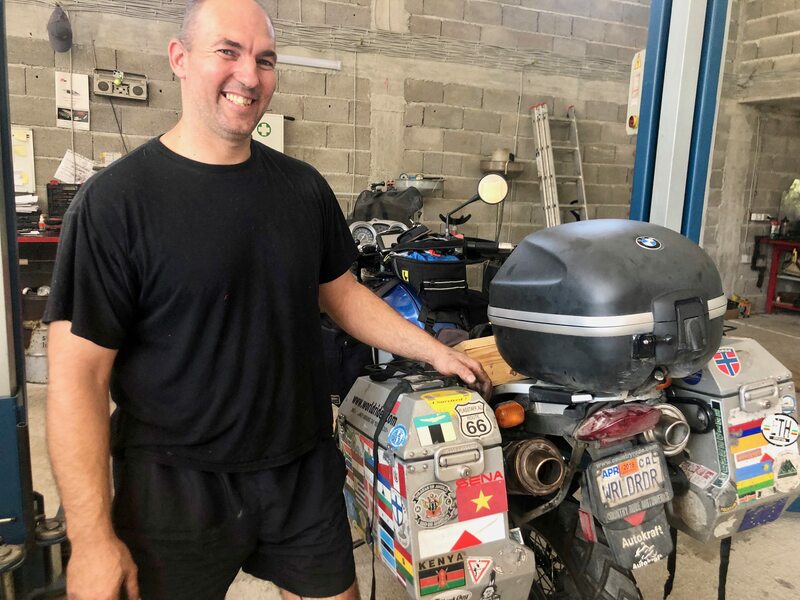 Though he told me he doesn’t work on motorcycles, Antonio of Mali Ston in Croatia was quick, convenient, and cost-effective. I use the downtime to download photos, update my journal, and research accommodation options for Dubrovnik. That’s when I realize how expensive Croatia is compared to the other four countries I’ve traveled so far. Typically I like to find a room as close to the downtown area as possible. This way I can park the bike and do my exploring by foot, mass transit, or taxi. For Dubrovnik, I realize, that is not possible. First, there are no vehicles allowed in old town, where I want to be. Yes, there are hotels inside old Dubrovnik, but the only parking options are in public lots outside the old town. Everything within a reasonable distance of the old town is expensive. My brother Jonathan offers me Marriott points, but the only Marriott property is a Sheraton about 12 kilometers south. 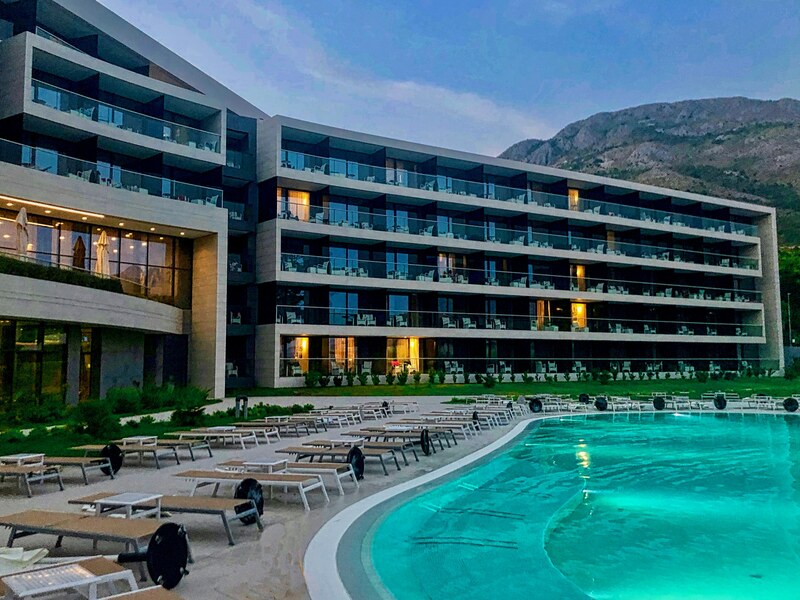 Part of the Starwood portfolio of hotels which Marriott purchased for some $13 billion in late 2016, I take only 30 minutes to find the Sheraton Dubrovnik Riviera Hotel in Mlini, Croatia. But there is a problem. Even though Marriott completed the merger two years ago, the consolidation of the points and rewards programs is a problem. It takes several hours and three phone calls to complete my reservation. Even then, the room is only available for one night. I’ll tackle that problem later. With a card key in hand, I go to unload my bike and park it in the Sheraton’s secure parking lot. 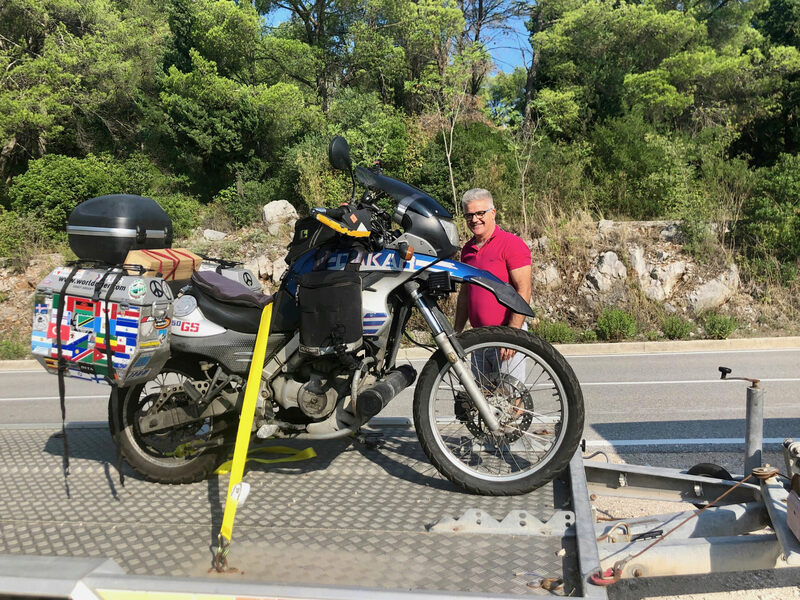 Perhaps the nicest digs I’ve stayed while on this journey, though the Sheraton Dubrovnik Riviera is luxurious it lacks the charm and hospitality of a small hotel like Mr. Krajl’s Hotel Ostrea in Mali Ston. A few miles south of the Sheraton is the cute village of Cavtat on the Croatian ‘Riviera’ coast south of Dubrovnik. When I get back to my bike, which is parked just outside the main entrance to the hotel, I realize that I left the key in the ignition and on. I’m an idiot, I think. My high-powered PIAA led lights have been on too. I’m screwed. My battery is dead. No power, no instrument lights, nothing. Just when I thought the journey would continue with my new clutch cable and rattle-less exhaust, I dip into a stupid absent-minded move. I want to blame it on the Marriott-Sheraton points debacle, after all, had the check-in been efficient my bike would not have been on for 3 hours. But that’s me looking to blame outside factors. Truth is, it was my bonehead move. The good news, so I think, is that the battery is new. I replaced it when in Athens last month. It should have the resiliency to rebound after a few hours. If it fails to recover enough amps to crank over, at least it will have a small charge, and with a good push and the slight downhill of the Sheraton driveway, I trust we can jump start Doc. Later I’ll need to go on a long ride without running the PIAA lights to charge the battery. The doorman tells me it’s okay to leave the bike there for the evening. Tomorrow, I hope, Doc will run again. https://i1.wp.com/www.worldrider.com/wp-content/uploads/2018/11/IMG_1696-1030x773-1.jpg?fit=1030%2C773 773 1030 allan https://www.worldrider.com/wp-content/uploads/2014/08/worldrider_logo_white_border-trans1.png allan2018-08-28 23:28:552018-12-01 08:54:19Hospitality, Service, and a New Clutch. But Wait! Now The Battery? Doc will start tomorrow with a slight push or someone to push you, then lights off a few hours while you travel and the battery will be as good as new again! I follow your trip carefully, my friend! A big hug from Argentina. Great to have you along for the ride, Dario! ! ! Thanks! Walls, Wine, Oysters, and a Plan Do I Need To Go To Dubrovnik?